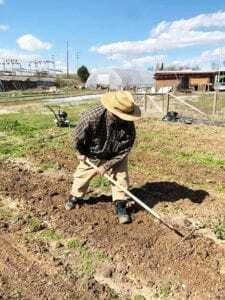 Pastor Battle working the land. cigarettes. The one place you will not pass is a grocery store selling fresh vegetables. In fact, there is no opportunity to buy fresh veggies within over 2 miles of his church building. Those with no transportation to get to grocery stores are forced to eat what is available around them. Pastors with Properties who stepped up to help end food deserts in the inner city. 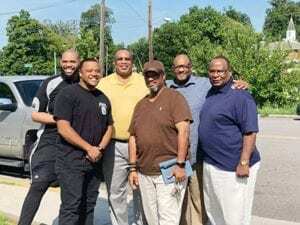 Pastors of Bethel AME Zion, Logan Temple, Payne Avenue, 7th Day Adventist, and First AME Zion have stepped up and have joined in to defeat the communities biggest enemy: lack of good nutritious fresh food. They are making headway. So much so, they are now in need of farmers, extra tools and more seeds. The next plan is to train the community on what and when to plant, how to harvest, even the art of canning. 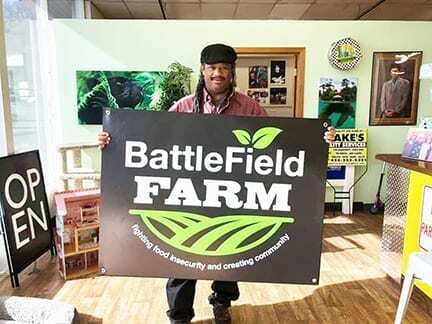 Those wishing to help with supplies, and seeds may contact Pastor Battle at Battlefieldfarm1@gmail.com or 865-441-4377.